Farley has taken up a lot of time during December. 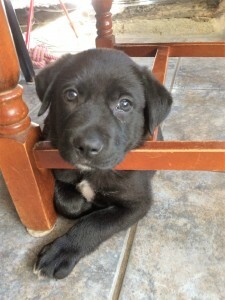 He is very playful and mischievous. We have been enjoying beginning to train him and he is very pleased with himself when he does well. Molly and Maple have been AI’d and we are hoping that they are both in pig ready for piglets in April. All the pigs are tucked up in their winter quarters at the moment and Farley loves to go up and talk to them and lick their ears. We are busy re-fencing part of the field which takes a while when mixed in with all the other jobs but we need to get it finished ready for the return of the sheep with their lambs in spring. We have met so many wonderful people this year. It has also been lovely to see so many returning guests who are now great friends. Merry Christmas and Happy New Year to you all. October was a month of hedge trimming and pre-winter garden maintenance as the weather was so dry. It was all systems go in the kitchen as well with apples coming inside to be frozen for winter crumbles by the bucket load and red cabbage pickling for the store cupboard. 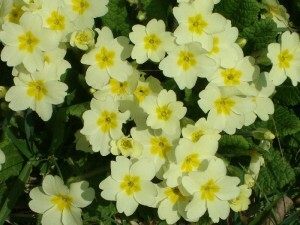 We managed to fit in a lovely trip to RHS Rosemoor to see the veg gardens and enjoy the beautiful atmosphere. Alister and his girlfriend attended a Halloween Ghost evening at Dunster Castle which is an annual event that everyone enjoys enormously. As quite a lot of you know Tavy passed away in August at the grand old age of 15. 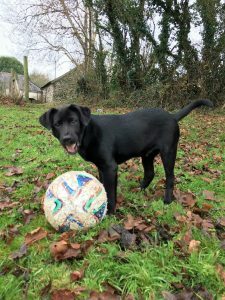 Everywhere was so terribly quiet without her and so we took the plunge and now have a new addition to the family who arrived in November. 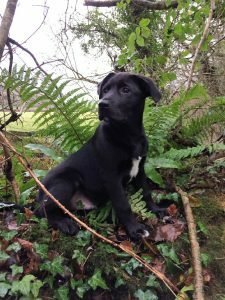 Farley is a Labrador/Collie Cross puppy. 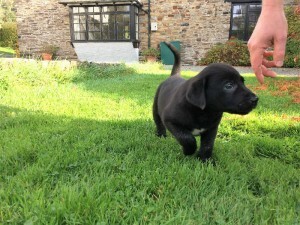 He is very friendly and full of mischief and is certainly keeping us on our toes! 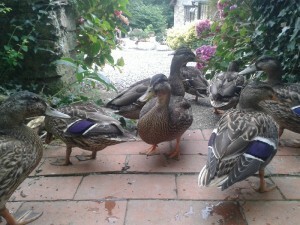 We have adopted some wild ducks which have chosen Lower Hearson Farm as their dinner venue of choice. Great fun had by all as they visit each cottage in turn for their snacks, banging on the doors. If it wasn’t August we could be thinking it is Christmas with the carol singers coming round. Holly and Molly are now in the woods enjoying some quality time foraging amongst the undergrowth. We have been hearing such great feedback from our guests about The Chichester Arms pub in Bishops Tawton (only a five minute drive away), some families eating there every day of the week that we badly wanted to give it a try ourselves. Fabulous food, lots of choice and generous sized portions. Main course and the pudding fills you up, only order a starter if you are an olympic grade eater. It is a fantastic place to eat. Fudge and Treacle have had a great summer making lots of friends and enjoying being fed in the morning and evening by all our little helpers. 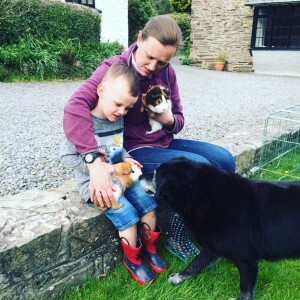 May half term was great fun with our returning regular guests and some “newbies” joining in with feeding the pigs, sheep and chickens. 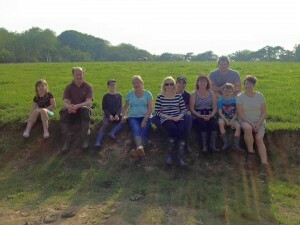 We all enjoyed a fantastic atmosphere of fun and laughter around the farm. Acorn decided she wasn’t pregnant after all returning to hogging early in May causing great disappointment for us all. June and early July were highlighted by families with pre-school children who are always so fascinated by everything that is here. At that age everything is a new experience for them and between the swings, games room, swimming pool and the animals we have the privilege to watch them soak it all up. By the end of the week they know the animal feeding routines well and are telling us where to go and what to do next as well as having worked out that there is time for a quick swing or bounce on the trampoline before tea-time. Maple and Acorn are now out in the field for their summer grazing. We are trying to get Holly and Molly out as well but every time we put them out they go back to their winter home wearing their electric fencing wire! They are going to need to go into a training pen so they can understand about electric fencing. 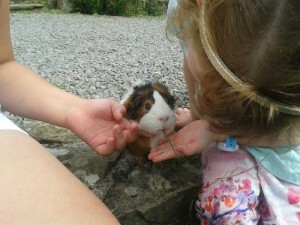 Fudge and Treacle, our guinea pigs, are thoroughly sociable and enjoy attention especially when it involves food. The Roundhouse also now has a leather sofa and armchair as part of it’s latest upgrade which was delivered in May. Very comfy. 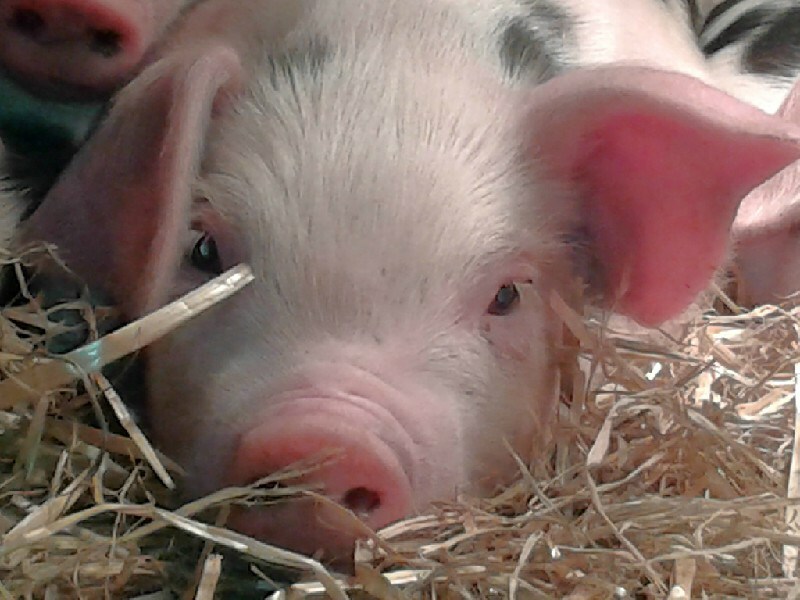 Maple presented us with 9 fantastic piglets on the 2nd March. All doing well. It is hard work when she farrows as she is very fidgety, getting up turning round and lying down all the time. We can’t leave her alone as we have to make sure she doesn’t squash any of the piglets. Luckily this year she farrowed at a sociable hour. 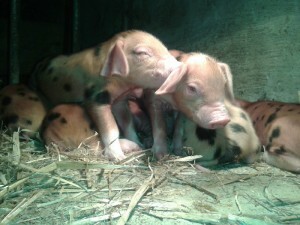 The piglets are really inquisitive and were wandering around outside within a couple of days. Acorn did not return hogging which means that hopefully she is pregnant. Piglets due in June. Threshing Barn had new double glazed bedroom windows fitted in March which look very smart and we have fitted a new power shower in her bathroom. We had a successful hatching of chicks on Good Friday and the children all enjoyed giving them a cuddle over the Easter holidays. 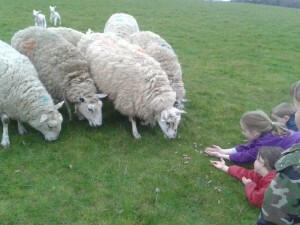 The sheep in the field were good entertainment as well as the children trained them to come to feed from their hands. The piglets were an instant hit with our guests and everybody, adults and children alike, enjoyed a good piglet wellie nibble as part of the morning and evening feeding runs. The children helped make Fudge and Treacle’s bed in their outside hutch and settled them into outside living again for the spring and summer months. The dust problem in our dining room has been instantly solved! Well, into the new year. Plough Monday (the first Monday in the New Year) was wet not a good day to start the ploughing! January has been a month of diving outside to tackle various jobs in between the showers. Some smart new fencing, new stile and paths completed ready for the new season. We had a visit from an elderly gentleman who used to be a farm worker here in the 1950’s as a child and young man. He had some fascinating stories to tell that has filled in some of the gaps of the farms recent history. The paint brushes and pots have been out for one of the bedrooms in the Shippon and there is plenty more to do before Easter. We have AI’d Acorn and are hoping that she is in pig. We will know for certain in the first week of March. Maple has been moved down to the barn as she is due to farrow in the first week of March. It is a busy piggy time! 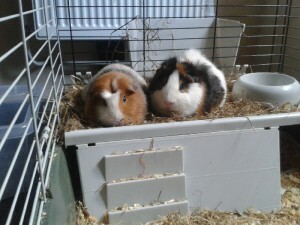 The guinea pigs are keeping us massively amused with their antics as they are living indoors with us for the winter. They can be found snuggling up together on the roof of their bed area for a sleep and the next moment chasing each other around the cage making a huge racket, sending their bedding flying in all directions and having a wonderful time. It will be good to get them back outside in their hutch at Easter as clearing up the dust in the dining room is a major chore! The seasons seem to be a bit confused this year. 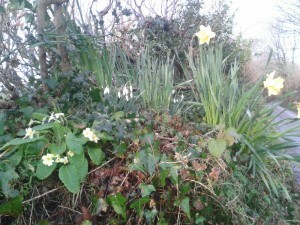 It is the first time that we have seen snowdrops, daffodils and primroses out at the same time.